Watch out for this seedy character! Despite its hard rind, it's not too tough to crack with the use of special attacks. 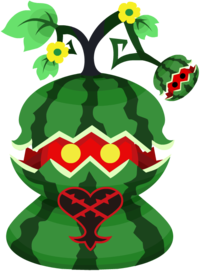 The Huge Watermelon is an Emblem Heartless that appeared in Kingdom Hearts χ during the Summer event in 2014. This page was last edited on 3 April 2019, at 17:41.